Can I love you better? Recently a member of my household has had their heart broken. It is hard to watch someone else feel sad and not know what to do! 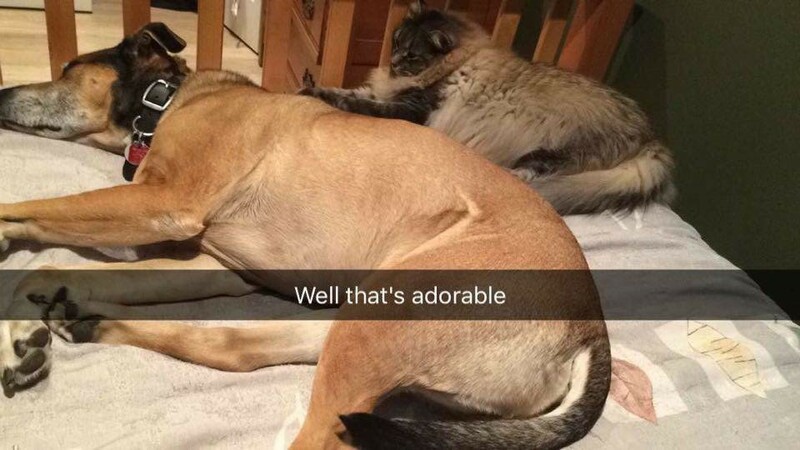 Then I realized that the dog and the cat intuitively know what to do, and frankly it is impressive. They just ‘be’ there. Both animals have parked themselves on the end of the bed or curl up at her side. They aren’t looking for anything in particular, they are just a silent presence in the room. And no, it isn’t coincidence that they are asleep by her feet, as most days that cat is curled up behind me by the desk and the dog is under it. I keep feeling like there is something I need to say , that there is wisdom I should impart that will make things better, but if I pay attention to my furry friends I realize that there are no words and that I should say nothing. All I need to do is be there if she wants to talk, and that I should let her come to me when she needs me. In the interim, I shall let the boys be there as a silent strength keeping her company and giving her love. The answer to my question, I do believe that animals can love you better, because they are so much wiser than us, they know how to be a support and provide strength to those that need it. What a gift it is to be born with the innate sense of how to love selflessly.